Most teens will experience some form of acne as they go through the formative years and that can often leave behind unwanted reminders in the form of acne scars. This can be a hard reality for many to face and the impact can often spill over into other areas of their lives due to low self-esteem and confidence. Beyond the surface, acne and acne scarring can cause a range of psychological damage and low self-esteem issues for people of all ages and stages. With a society that is so obsessed with first impressions, often those with acne don’t feel confident enough to put their best self forward. They somehow think that the blemishes define them. It doesn’t have to! Many celebrities suffer from acne scarring into their adult lives and talk about it openly. Look at Brad Pitt, considered one of the most beautiful actors of our time; or Emma Stone, who continues to suffer from acne to this day. But, what happens when the problem advances beyond regular acne? Cystic acne is beyond normal acne… it is acne plus and is caused when the infection goes deep into your skin, creating a red, tender bumps that are full of pus. Beyond the general look, it often hurts and can itch; and if a cyst bursts, the infection can spread, causing more breakouts. For those of us who deal with acne and acne scarring, we’ve heard it all. The strangest remedies that our clients tried before coming to us – toothpaste, apple cider vinegar, tea tree oil, witch oil, low glycemic index diet – you name it, we’ve heard it. Plus, if these actually worked, we’d be out of a job. The only thing that is proven to help deal with acne and the lingering effects of acne scarring is to seek out a professional in skin care, such as our team at Oak Lake Medical Centre and Spa. We combine minimally invasive cosmetic skin treatments with non-invasive cosmetic skin treatments to maximize the results of scar treatments with less downtime and less discomfort. At Oak Lake, we have found great success with PRP, short for platelet-rich plasma therapy, treatments with our clients suffering from acne scarring. Simply put, PRP refers to the process of drawing a patients’ blood, which is then spun in a special centrifuge specifically designed to separate the platelets. Once the platelets are separated, they are then prepared and injected into the desired area, such as where acne scarring is the greatest. The collagen and elastin that are injected back into your skin will actually plump up the skin creating a smoother appearance, decreasing the visible signs of pitting left from the scars. When you combine this natural process with other treatments, such as laser skin resurfacing, you can achieve the smooth look you’ve always wanted. 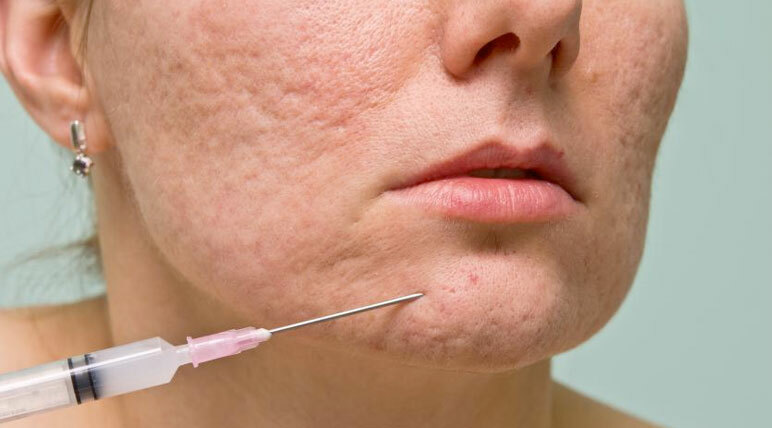 If you want to find out more about PRP and other acne scarring treatments, we recommend that you continue browsing through our website or schedule a consultation with us today! We can be reached at 289-837-4747 or by completing the form below. We look forward to connecting with you! Oak Lake Med Spa is located at 146 Lakeshore Rd W in Oakville. For more information about PRP treatment, or any of our other cosmetic treatments, please feel free to continue browsing through our website. We can be reached 289-837-4747 or by filling out our contact form.